All our product reviews are from actual customers, just like you! These are a few of our favorites for the month of September. Kingsley Vest – Carnival: Wonderful! Can’t say enough about this vest! The actor I bought it for, couldn’t believe his luck! 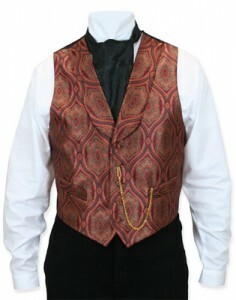 The vest is a great addition to the outfit I’m doing for a play, and I will use GE everytime I need a piece to fill in a space or two! The customer service was excellent as well! Better than any place I’ve done business with, and that includes my everyday stuff! Eve is great! If you want great service and wonderful people to work with, here’s the place. I have a 34 inch waist but measured 39″ for the wear point and ordered a size 40. A 38 would have put me in the middle hole but I’m using second to the last (just a heads up). The leather and craftsmanship are incredible. The color is almost an exact match to the online photo which doesn’t happen very often. 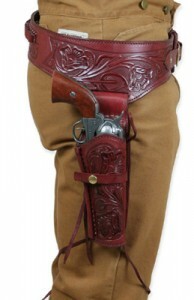 My old model Vaquero .44 is a perfect fit in the holster with very little breakin needed. The cartridge loops are tight even with .44 but it didn’t take long for them to give just enough. These are the real thing, meant to last and take a lot of punishment doing it. The draw is fast and clean and if you bend the top flap out just a little the return on a spin is perfect. I have ordered from other vendors and gotten a thinner belt/holster with bad color matching that cost more than this rig did. I will be back for more and these are highly recommended. 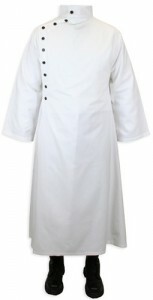 Mad Scientist Howie Lab Coat – White: REALLY Surprised! I have been disappointed in the past by other websites that promise great costumes and pretty much deliver trash. THIS was not the case with Historical Emporium! 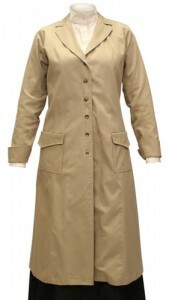 The Lab Coat was authentic looking, of GREAT quality as far as material is concerned and the attention to detail superb! I have already recommended all my friends shop your website for their costuming needs I will be visiting again in he future for sure! Great job! I’ve been purchasing clothes, hats and more for years at the Historical Emporium. When I can’t find what I want anywhere else in the word, I just come to the Historical Emporium. I love period clothing and wanted a duster like I purchased for so long. I waited years to get one. Couldn’t find it anywhere. Fits just great. If it didn’t I know I’d have no problem returning it or exchanging it. Historical Emporium has the most amazing and friendly customer service. It’s like shopping at an old country store with amazing service. It’s sort of like going back to a time when personal real live people care which at this time is rare. I can’t say enough about all of my purchases from Historical Emporium and can’t wait to get more soon! Thank you! 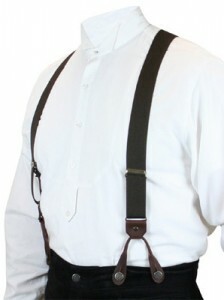 Brown Elastic Y-back Suspenders (Short): I Didn’t Listen! After Wearing My Trousers a Time or Three, I Discovered My Trousers Tended To Ride Down a Bit. Then The Thought Came To Me… DON’T FORGET SUSPENDERS! Now My Trousers Stay Put and They Look Great! The Suspenders Too! Ride On! 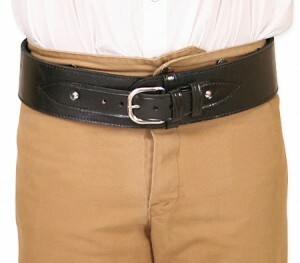 Powder Belt – Plain Black Leather: Perfect Belt! I use black powder… do you have ANY idea how hard to is to find the perfect gun belt that doesn’t have the damned bullet loops on it? VERY hard. Thus, my surprise to not only find one here, but, a gun belt that fits *MY* fat a$$! It fits so well, and is of such high quality, it’s a bargain at twice the price! LOVE it. Fits great, and is so comfortable! 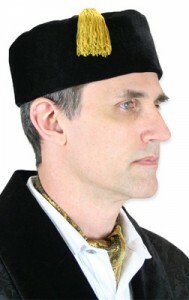 Vintage Quilted Smoking Cap – Black Velvet: Hats..on to you.. I love it…my wife hates it. But it keeps my bald head warm in the house. Want to review a product? Be sure to watch for our email about a week after your order arrives. ← Perfect Couples, Part 3!